Today's tutorial is from the talented Elizabeth, who blogs at Ocassional Piece - Quilt. 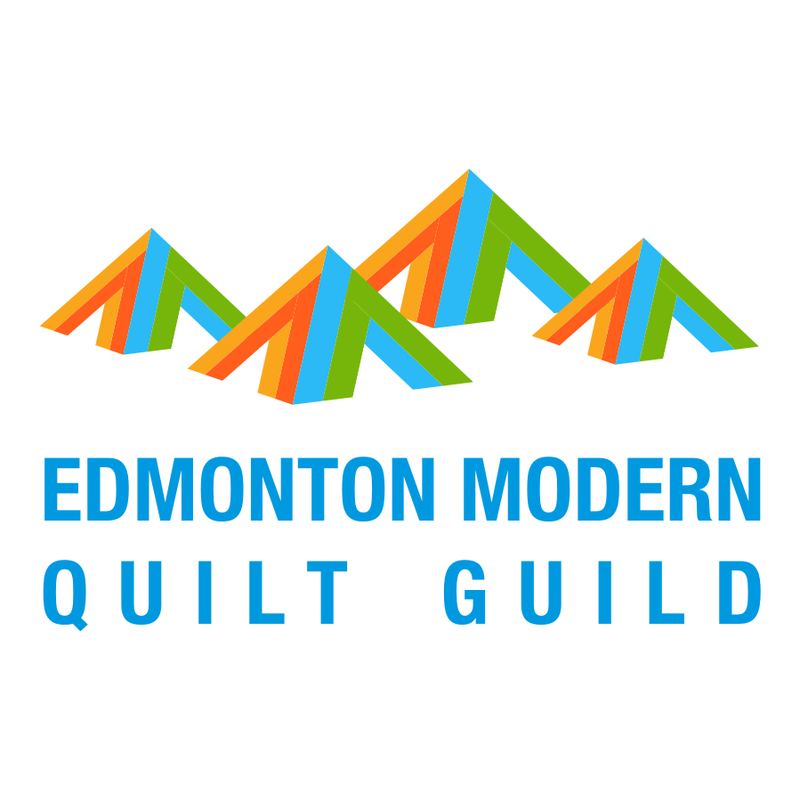 Elizabeth is an experienced quilter with a degree in Clothing and Textiles. 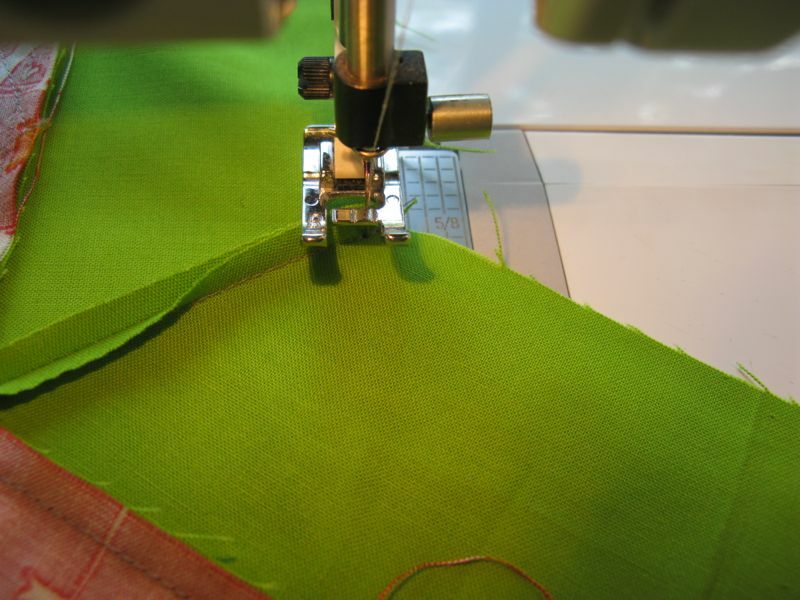 Elizabeth has put this excellent tutorial together to demystify the legendary "Y-seam" for us. 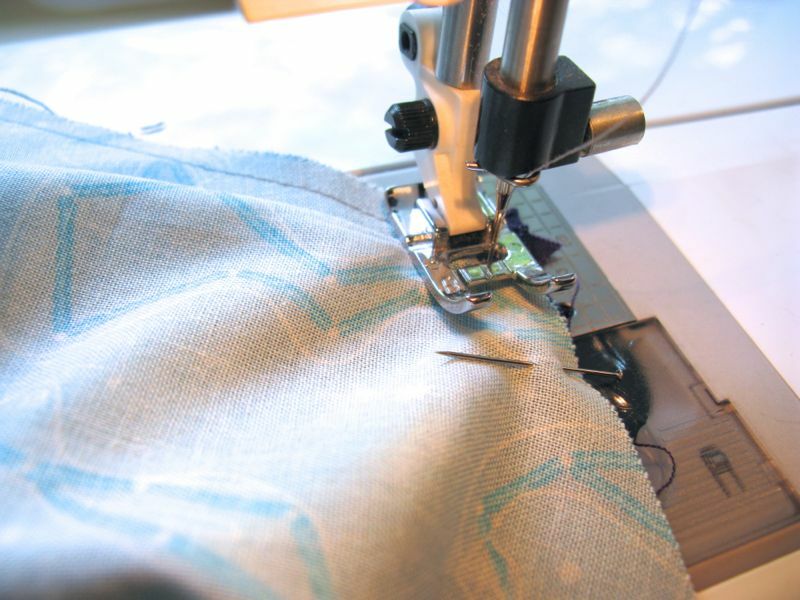 Soon you will be sewing y-seams without even a blink, read on. Hi! 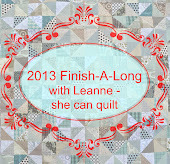 I'm Elizabeth and I blog at OccasionalPiece-Quilt, or OPQuilt, for short. 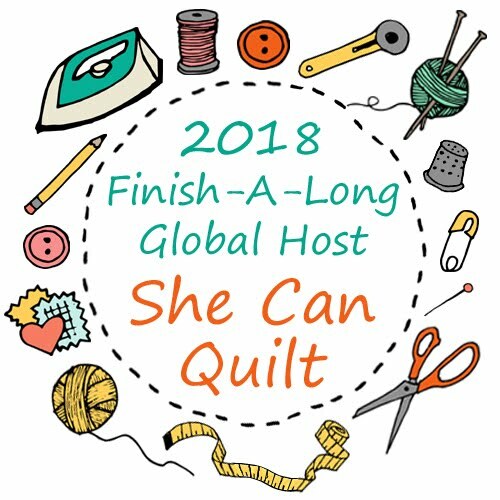 I've been sewing and quilting for more years than I should admit to, and during that time have completed over 120 quilts. So I've faced down more than my share of the Dreaded Y-seams. 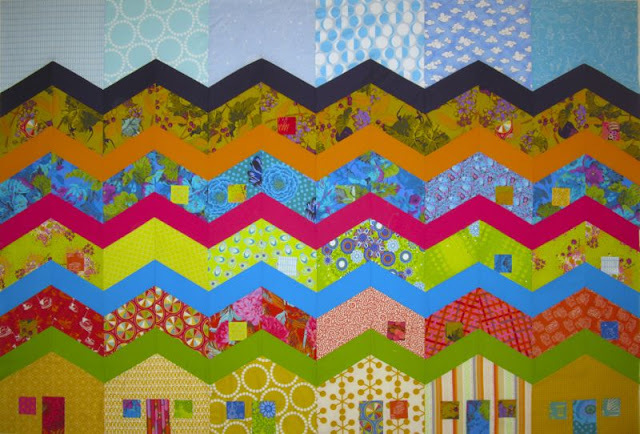 In June of this year, I made this quilt for my sister, titled Christine's Philadelphia. As you can see there are lots of peaks and valleys in this thing--lots of Y-seams going both ways (some people call them Y-seams and V-seams) but really, let's keep it simple. 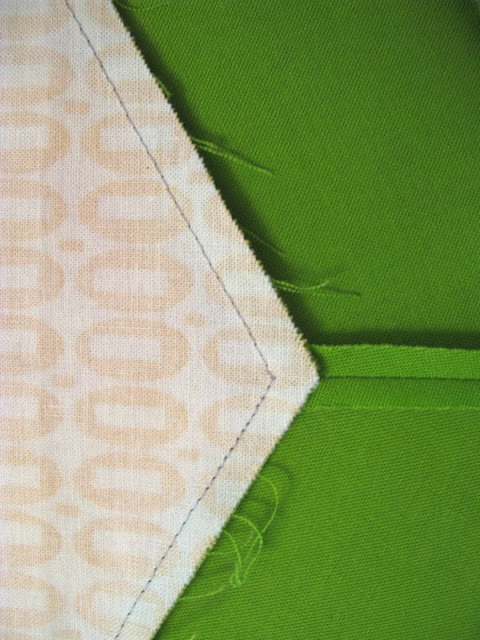 They are called Y-seams because the V-part of the letter Y usually has fabric with no seam, and the tail of the Y has a seam. I've marked the Y for you in red in the picture on the left. 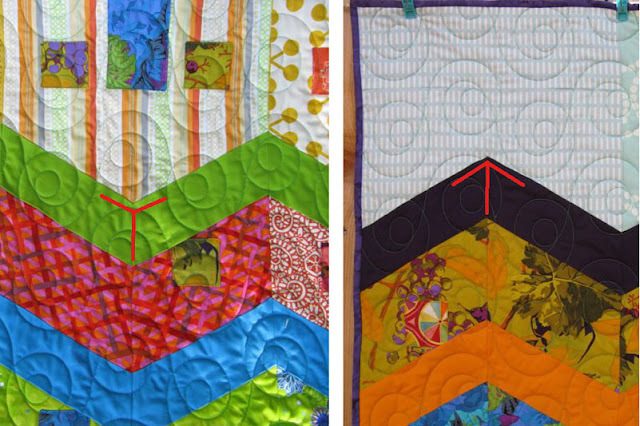 The picture on the right is the other type of Y-seam. I'll show you both. Let's start with the first type of Y-seam, where the "tail" of the Y is facing toward you and the "V" of the Y is underneath. 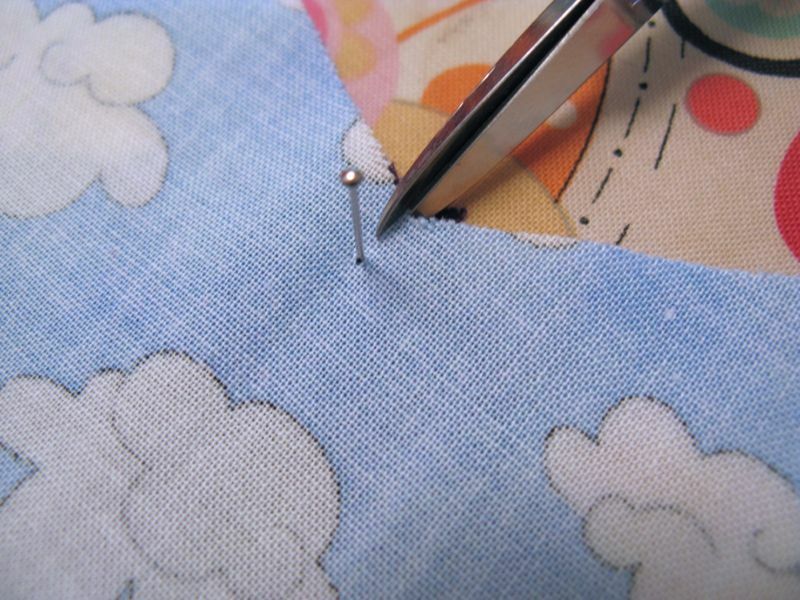 Place a pin at the 1/4-inch mark through the seam, and into a spot that would be the peak of the 1/4" seamline, if you could draw it on and imagine it. 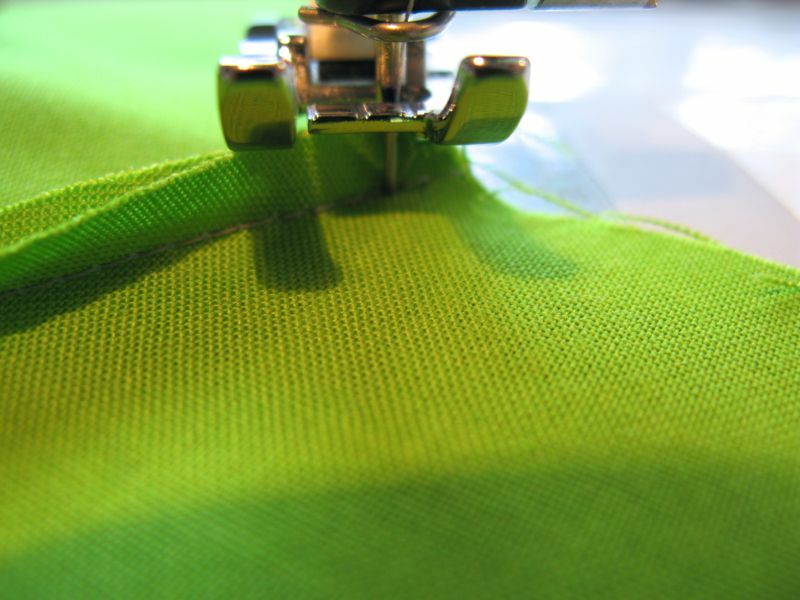 Most beginners want to pin that seam to death. That makes me want to run screaming in the other direction. 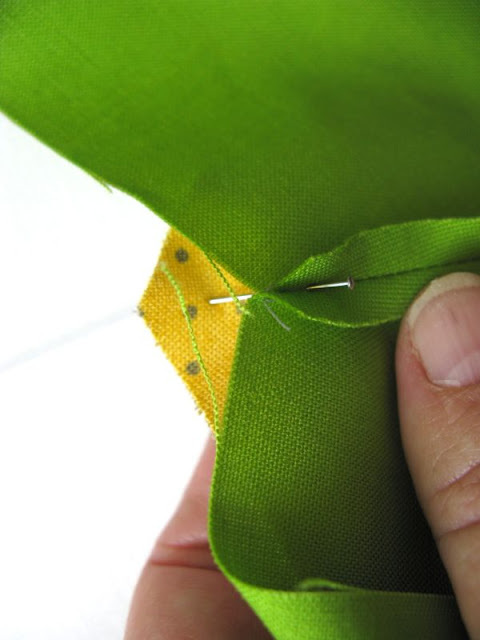 The success of your Y-seam depends on the "float" of the fabric. I sometimes will place one pin on either side of the seam, just to anchor it as I get going, then another pin or two along the starting point. 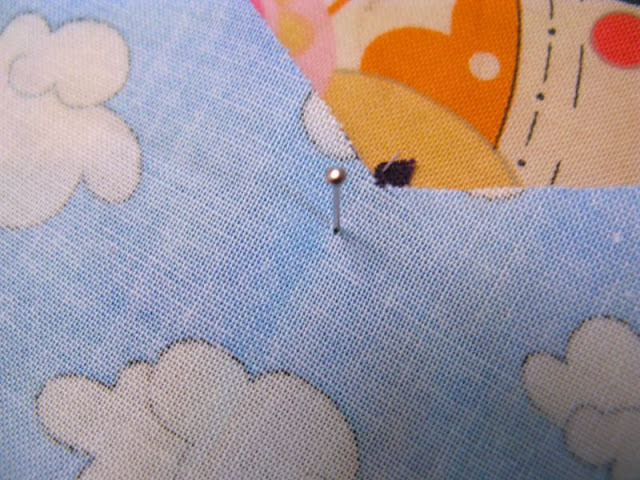 Then I take out the (above) pin. Again, I want my fabric to float -- don't want to anchor that second half of the seam too much, as I need it to pivot. 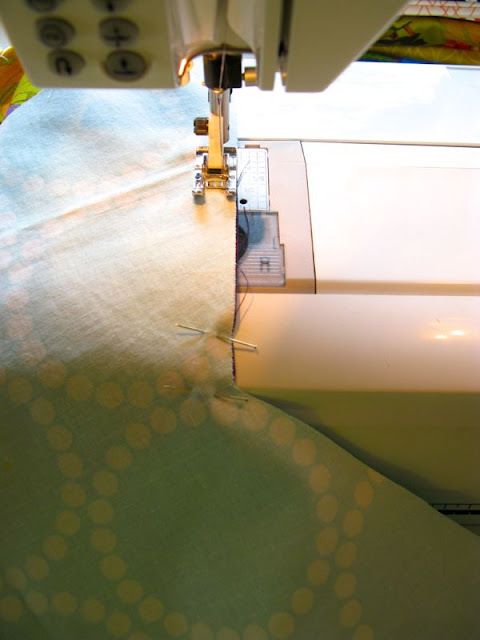 Start sewing from the left edge, as the seam faces you, using a 1/4" seam allowance. Fold the seam toward you, and as you approach the seam, slow down and use a bit smaller stitch. 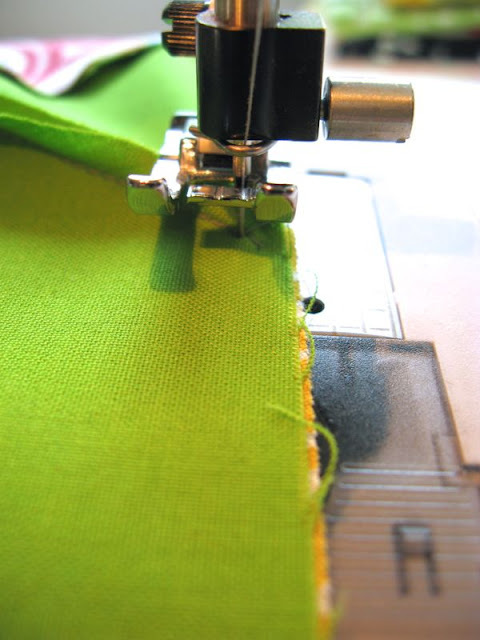 You are trying to anchor the stitching a bit. When you get to the seamline, when you are on top of the thread marking that other seam, STOP. 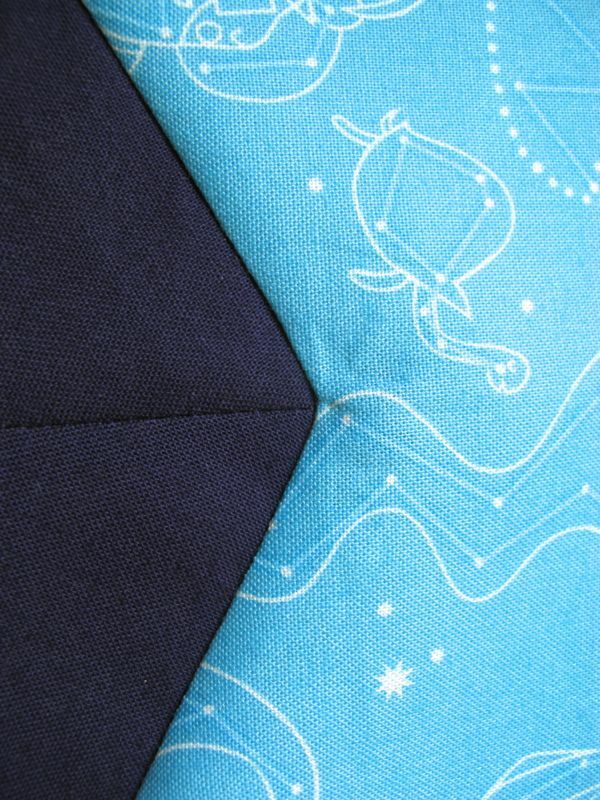 Make a tiny stitch on top of the one before to anchor, but DON'T GO OVER THE SEAM LINE. Lift your needle out of the cloth. I pulled it away to show you what I mean, but you don't need to do that. 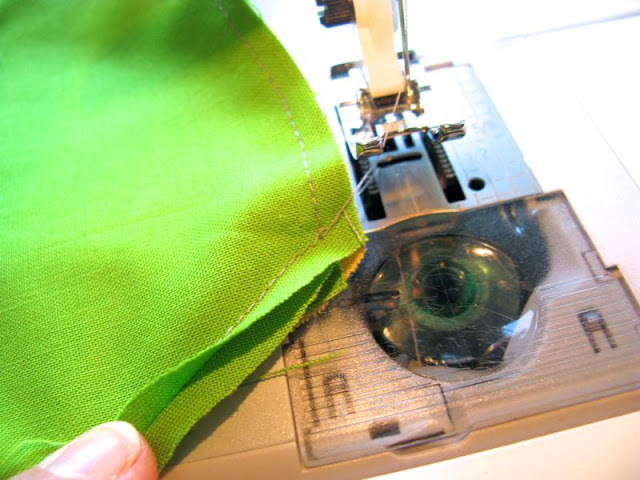 Just give yourself a little room to smooth the (green) seam allowances out of the way, and to find the place to insert your needle again. 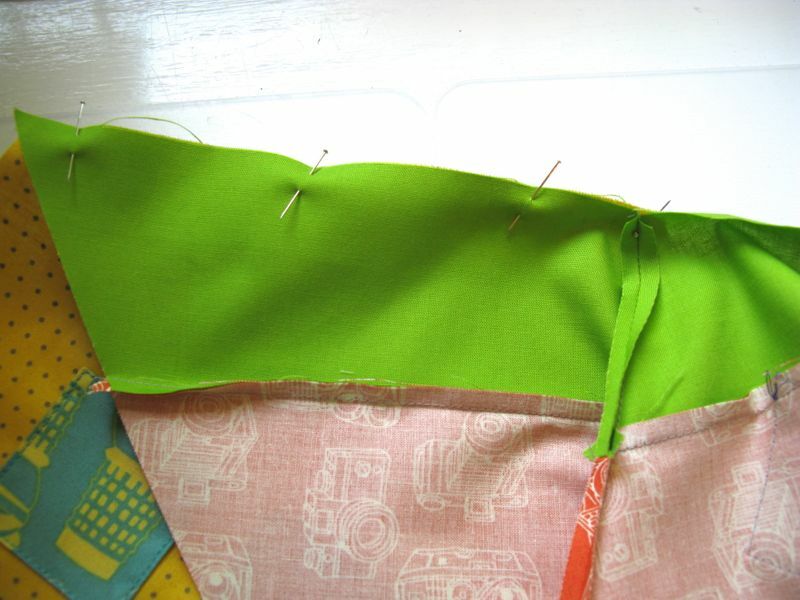 Now we'll tackle the other kind of seam--where the seam of the Y's tail is underneath, and you see the "V" part of the Y.
Snip to within a couple of threads of the pin. 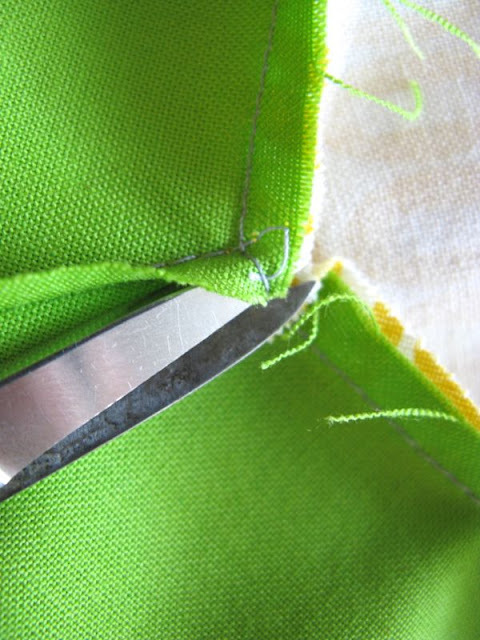 Leaving the pin there insures that you won't cut too far. If that happens, curse a little. You can sometime rescue the piece with a bit of fusible interfacing. Better to not cut too far. 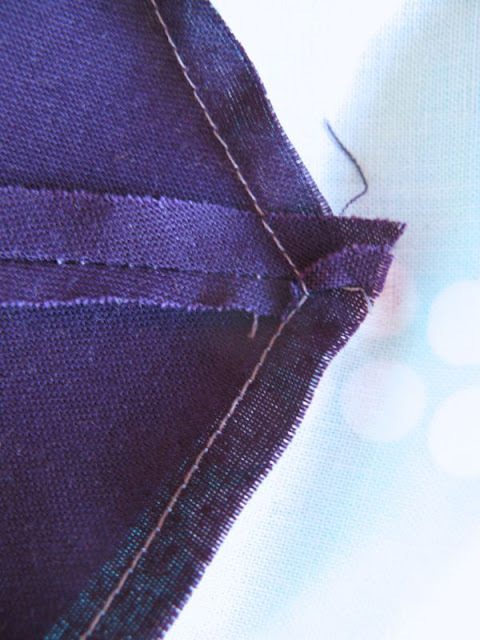 Half of the seam (1/8") is all that's needed. Find the 1/4-inch peak of the seam below, and poke the pin in to anchor. 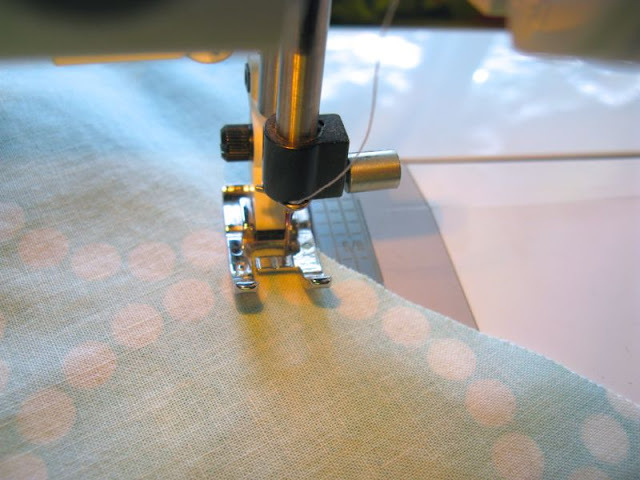 You can leave in that center pin to hold it, and if you are afraid it will slip, it's okay to put one pin on the backside. If you can, try to avoid that pin on the right. 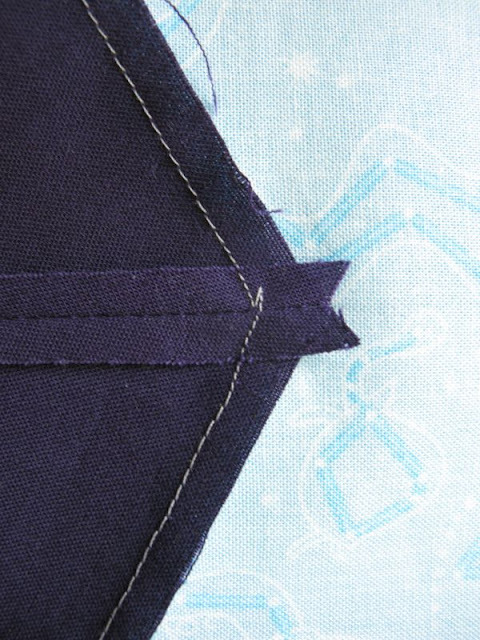 Again, the success of a Y-seam lays in the ability of the fabric to move and pivot. 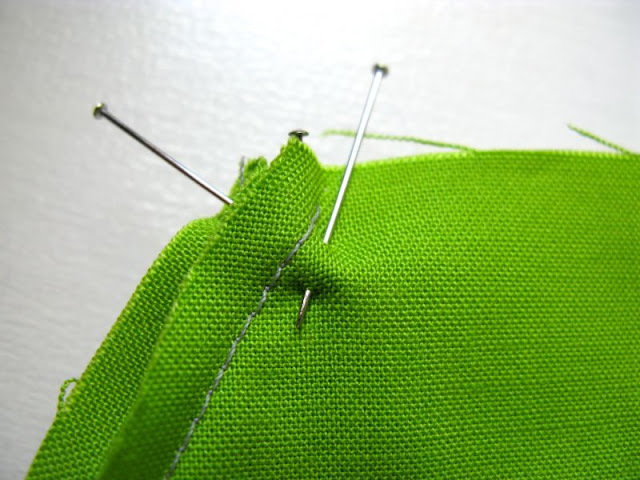 When you get to the pin, STOP with your needle down in the fabric. 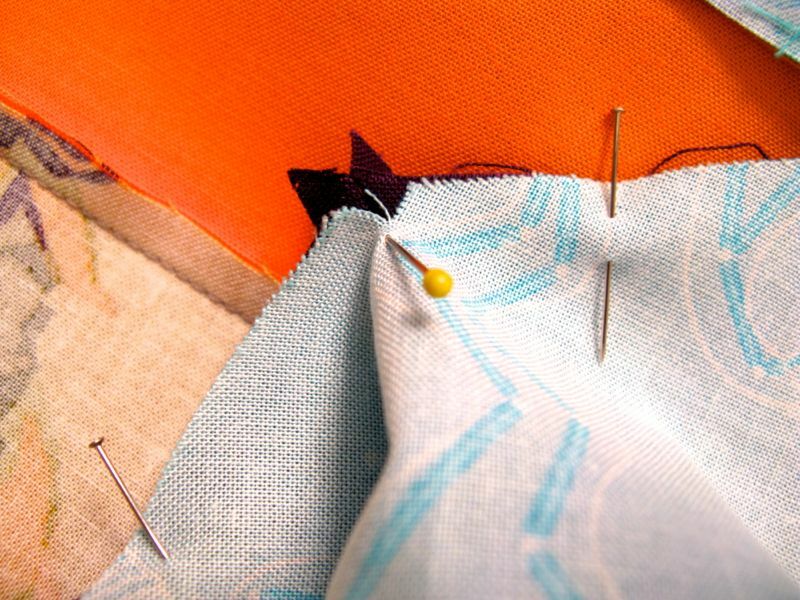 Remove the pin, then pivot the fabric so that you can match raw edges. As you align the new sides, it may feel a bit bulky under your foot, but smooth any excess fabric out away from you. 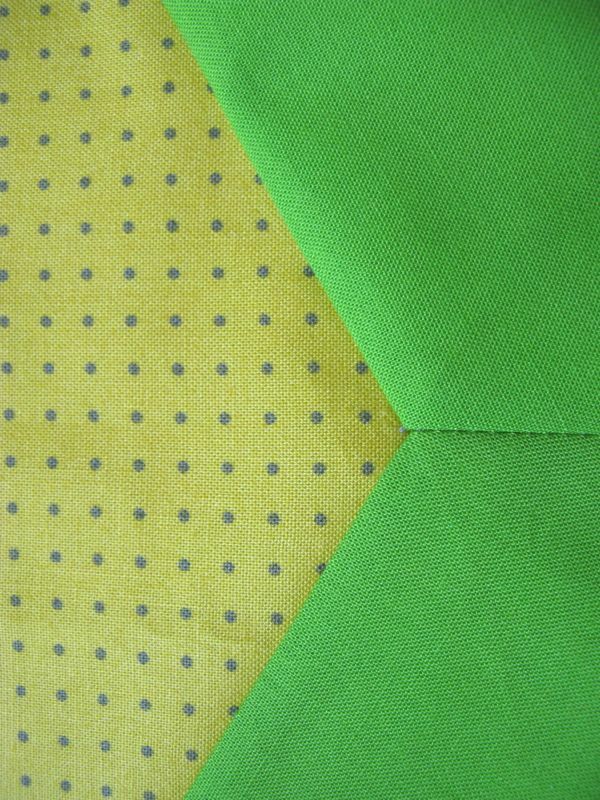 Here you can see that I've pivoted, repinned the new raw edges together and am starting down the other side of the seam. The front. Give it light press. 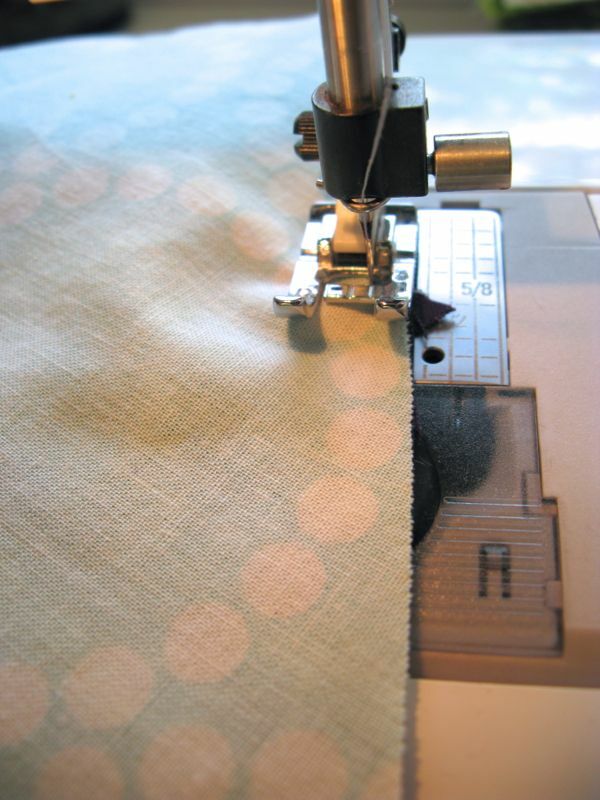 Resist the urge to saturate it with your pressing goo and mash it flat with your iron. A shot of steam and firm pressure with your fingers can usually help the most reluctant point to behave. Sometimes your seam gets a little jig-jaggy. As long as it's not too bad, it will be fine. 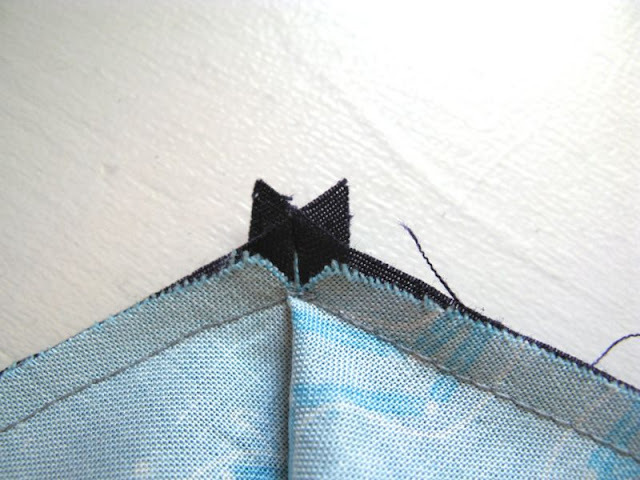 I did the same kind of stitching process on this seam: shorten your stitches as you approach the point, then lengthen them out on the other side. A better point. 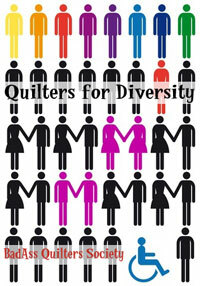 All of these work fine in the quilt, because you haven't, a) stitched it to death, and b) murdered it with your iron. Thanks for the tutorial. 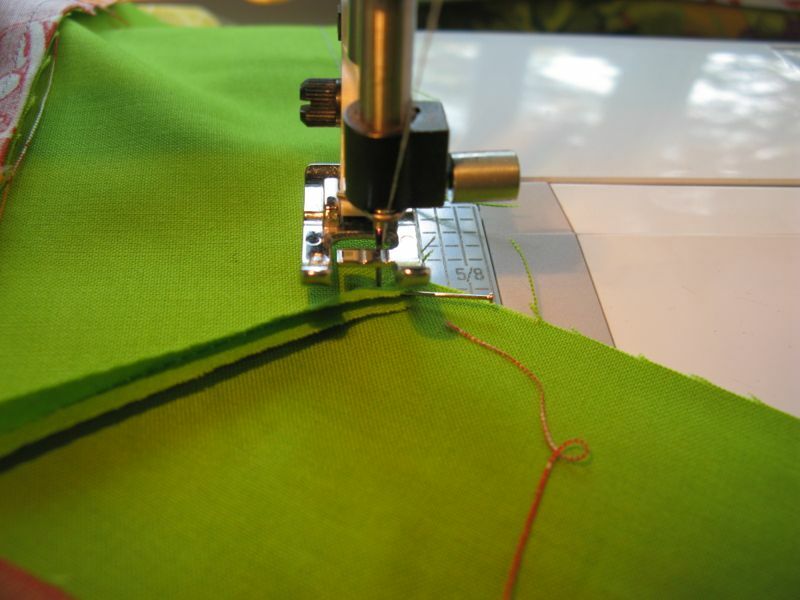 You actually stitch with the sewing machine like you would do when you stitch by hand, which is always more forgiving. Great illustrated tutorial, thanks! I especially liked the instruction, if that happens, curse a little. Yes indeed; softly, under your breath, say a bad word, lol. 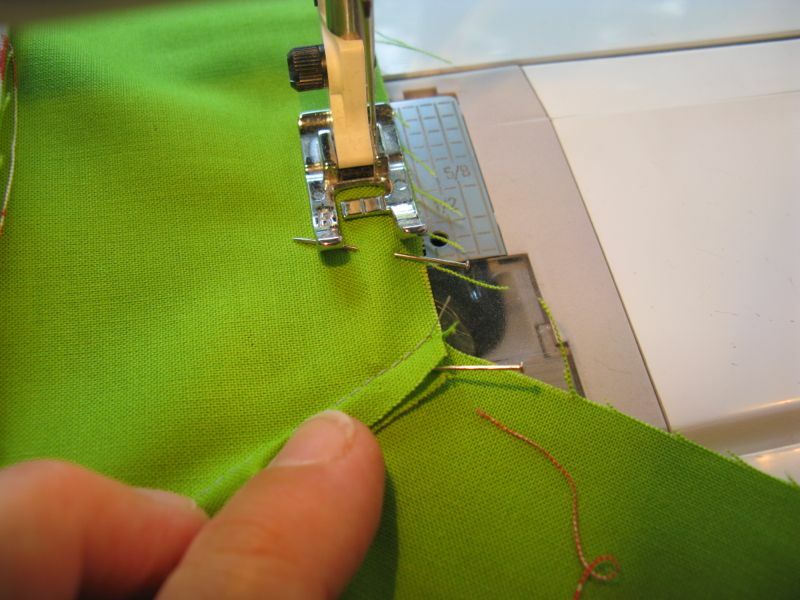 I've done Y seams before, but never even thought about V seams. Makes sense though! Fantastic - thank you - I have no fear of the Y, but the V is genius! Congrats on a great tute! Fab tute! Thanks so much. You are awesome! 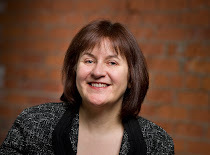 I had been in many, many blogs and never had heard this "and I encourage you to change that." you have a sweet heart, I hope you´ll never change!! Very scary but am going to give it a good old try! Many thanks for the great photos, they helped forming a view in my brain so I can transfer it to my machine!